After a few nervous days, I'm so grateful to be back here on my blog. Last week I got a virus/spam email that I didn't handle well, and Google deactivated my gmail account and removed my blog until I could show them I'm not a spammer. Fortunately they have ways all set up to do that, and I now have my mail and blog back. I could have dealt with setting up a new mail account, but losing my blog would have been really hard. I've put in a lot of time here, and it's how I communicate my show schedule - I'm really grateful I don't have to redo all that work! Speaking of work, here's a photo of me taken by Duffy Schade at the Art For Nature's Sake show in Glastonbury. 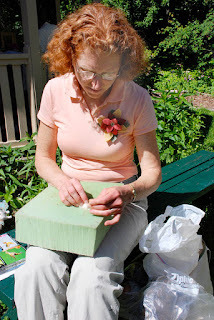 It was a lovely, sunny morning, perfect for sitting out and working on a bird. I've got my fiber bags on one side of me, and my bird guide on the other. 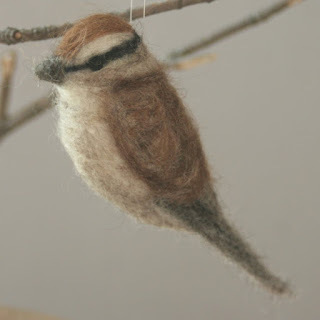 Here's my latest addition to the bird collection: a chipping sparrow. To me, they sound like a sewing machine. See what you think by listening here. Glad you are back. And, it was so good to see you in person this weekend. The chipping sparrow just freaked my rabbits out! Since it is similar to a sewing machine, you'd think it wouldn't bother them. Of course it may have been the volume. The last sound from the computer was someone playing Metallica! Silly! Glad to hear someone is using the link to Cornell!